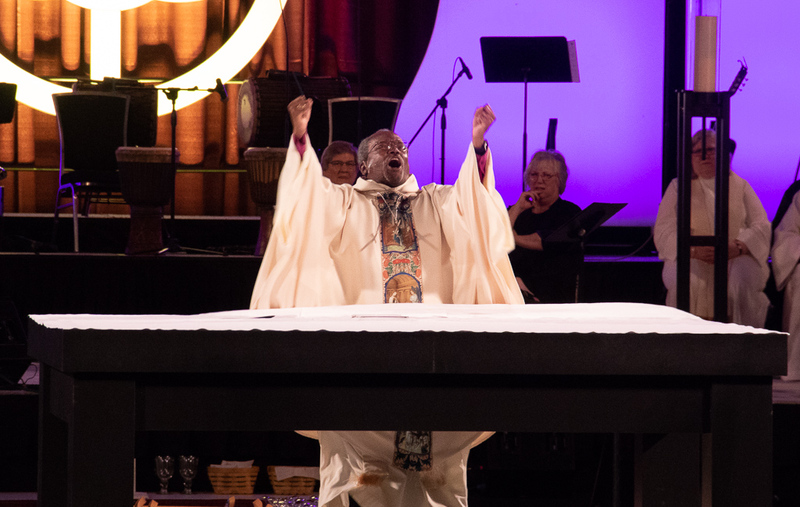 [Episcopal News Service – Austin, Texas] The opening Eucharist of the 79th General Convention of the Episcopal Church on July 5 included lively music in many styles, communion for thousands of people and a sermon by Presiding Bishop Michael Curry calling on members of the Episcopal Church to embrace spiritual practices that can help lead them to a Jesus-centered life. Called the “Way of Love,” the seven practices provide a Rule of Life that all Episcopalians are encouraged to adopt. Turn: Pause, listen and choose to follow Jesus. Learn: Reflect daily on scripture, especially the life and teachings of Jesus. Pray: Spend time with God in prayer every day. Worship: Gather in community for worship every week. Bless: Share one’s faith and find ways to serve other people. Go: Move beyond one’s comfort to witness to the love of God with words and actions. Rest: Dedicate time for restoration and wholeness. Full ENS coverage of the 79th meeting of General Convention is available here. He also encouraged everyone at General Convention to spend time meditating on the life and teachings of Jesus before they take action, including before speaking at a microphone. Volunteers handed out brochures describing the practices to people as they left the worship hall. Materials explaining the Way of Love have been posted on the Episcopal Church website. The text of Curry’s sermon is available here. – Melodie Woerman is director of communications for the Diocese of Kansas and is a member of the ENS General Convention reporting team. Where would we obtain copies of the handout? It’s included with the materials at the link, under the Way of Love tab: https://www.episcopalchurch.org/files/documents/wayoflove_brochure_spreads_english.pdf. I’m excited to start digging into this! Thank you, Bishop Curry, for providing guidance in spiritual training that’s accessible to everyone. 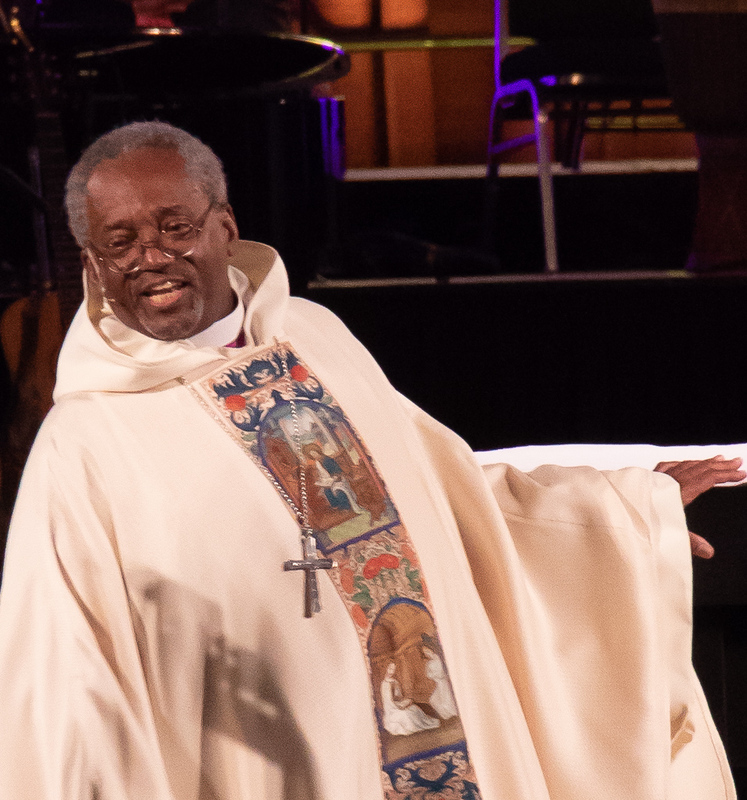 What an awesome blessing Bishop Curry is to our church, and especially to serving JESUS. I AM PROUD TO BE A PART OF A CHURCH THAT IS INCLUSIVE. ALSO, A CHURCH THAT SERVES THE NEEDS OF EVERYONE REGARDLESS OF THEIR SOCIAL STATUS, HOW THEY APPEAR, AND WHAT THEY BELIEVE. Where can I find a link to watch or hear the sermon? Scroll down a bit. The video of the sermon is embedded in the article.